A for nouns that talk about one person or thing. An for nouns beginning with a vowel sound. The if you know what is being talked about. Peanut. No vowel sound and I don’t know which peanut he is talking about so a. Elephant. Eh-lee-phant. Vowel sound so an. Moon. Moon. Only one moon so I know which moon he is talking about so the. Kettle. Easy. No vowel sound so a. Now the difficult part – which is the largest? Hmmm . . . Remember: The moon is larger than an elephant. Put a, an, the or nothing to complete each sentence. If more than one answer is possible, tick both. Put a, an, the or nothing to complete each sentence. Who is ___ girl standing by the car? Who is the girl standing by the car? We know which girl – the one standing next to the car. 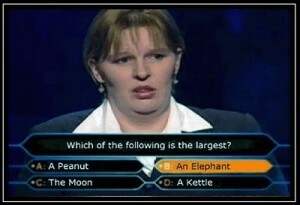 She is ___ intelligent girl. She is an intelligent girl. Vowel sound (in-tell-i-gent). Not the because there are lots of intelligent girls. I saw ___ ugly baby this morning. I saw an ugly baby this morning. Vowel sound (uh-glee). Not the because it is the first time the baby has been talked about so the listener doesn’t know this baby. Do you want ___ rice or ___ baked potato? Do you want (NOTHING) rice or a baked potato? Rice is uncountable. No vowel sound (bay-k’d). I would like ___ orange. I like ___ oranges very much. I would like an orange. I like (NOTHING) oranges very much. Vowel sound (oh-rang). Oranges is plural. I’m sick. I need to see ___ doctor. I’m sick. I need to see a / the doctor. A doctor if we mean any doctor. The doctor if we mean the is only one doctor or we have seen this doctor before and we know which doctor is being talked about. ___ beer is good for you. (NOTHING) Beer is good for you. Please can I have ___ glass of beer. Please can I have a glass of beer. I have ___ book. ___ book is very interesting. I have a book. The book is very interesting. A because it is the first time we have talked about it. The because it is the same book as in the first sentence, so we know which book we are talking about. What do you usually have for ___ dinner? What do you usually have for (NOTHING) dinner? No a, an or the before the names of meals. ___ story he told me was boring. The story he told me was boring. The because we know which story it is – the one he told me. This painting was painted by ___ famous Russian artist. This painting was painted by a famous Russian artist. A because there are many famous Russian artists, so we don’t know which one is being talked about here. Gary’s birthday is on ___ sixteenth of October. Gary’s birthday is on the sixteenth of October. The because there is only one sixteen of October in a year. Bali is ___ island in the Indian Ocean. Bali is an island in the Indian Ocean. I suggest you try ___ chicken soup. I suggest you try the chicken soup. What is ___ name of ___ next station? What is the name of the next station? The because there is only one next station and it only has one name. Look at ___ sky. It is going to rain. The because there is only one sky. Re-write each sentence CAREFULLY using a, an or the where necessary. Where’s pen I lent you last week? Where’s the pen I lent you last week? I hate (NOTHING) cigarette smoke. Lions and tigers are beautiful animals. (NOTHING) Lions and tigers are beautiful animals. I really need (NOTHING) advice. Advice is uncountable. To count advice, we say a piece of advice or some advice. They were late because they had flat tyre. They were late because they had a flat tyre. I don’t know anywhere in world as beautiful as here. I don’t know anywhere in the world as beautiful as here. I was really angry because I missed bus. I was really angry because I missed the bus. We know which bus is being talked about – the one she missed. I’ve got to get to post office before it closes. I’ve got to get to a / the post office before it closes. A if we mean any post office. The if we are talking about a specific post office. Please turn off light when you leave? Please turn off the light when you leave? We know which light is being talked about – the one that is on. A man in a white t-shirt is riding an orange bike. He is looking for a place to park the bike. The man on the bike parks it inside the white van.